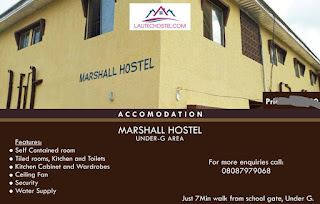 Do you need an Hostel Accommodation? With just #85,000 get a Self contain room at MARSHALL HOSTEL, UNDER-G.
With just #42500 get a roommate at the same hostel above. ✔ Tiled room, kitchen and toilet. ✔ Kitchen cabinet and wardrobe.